Is the Roving Garden Railway just a good idea? One of the cool aspects of meeting new garden railroaders is learning a few new tricks. The Roving Garden Railroad has attracted its share of innovative ideas, many of which have been implemented and displayed at our recent West Coast Regional Meet. One such innovation came from Tony Cullen whom I met at the San Leandro Historical Railway’s open house last year. Tony wanted to see the trailer and had his nephew drive him and his wheelchair down from Sacramento to one of our work parties. He was anxious to show us his invention, something I’d never seen before. The train was average, but all eyes fell on a little old railtruck hauling crates of squawking chickens, which scooted along on the tracks just in front of the loco, seeming propelled by magic. I wanted one. My version is a bargain Bachmann handcar, whose motor gears had been broken: on the rear bumper Eric Moe mounted a powerful magnet in reverse polarity to another one on the front of the loco. See photo. Now on the same loop two engines “share” the track, but only one needs to be powered. It’s fun to see the handcar drivers bobbing up and down trying desperately to outrun the engine, which always keeps a safe distance. Getting ready for the National Model Railroad Association Convention, I’d like to take a moment to thank all of you who have helped with the BAGRS’ Roving Garden Railroad. So many BAGRS members have come long distances to pitch in, and the fruits of your labor are growing in the mobile garden that we usually call “the trailer”. The regulars, such as Terry Hurley and Edward Van Pelt, keep plugging away when no one else shows up, so their commitment along with the necessary random helpers has produced an incredibly unique project that BAGRS can be proud of. Even though the geodesic scenery wasn’t finished and painted at the annual meeting, this outreach project attracted a new helper, Seth Abrahams, who was more fascinated with the way the trailer sides close up then in the garden aspect. He has welded detailed bridges and structural gizmos, so that setting-up/closing-down time is shortened and safer. Wait 'til you see his ingenious stanchions, which we discovered (see photo) are much needed around children. My sister saw that it could use mock-mountainside skirts to hide the trailer hitch, so she’s sewing them as I write. “Build it and they will come” seems to be working for us. But, we need you, too, even if one time, because it may be your addition that attracts the next hobbyist. July 5 and 6 Terry and I will take the outreach trailer to Sacramento to participate in the NMRA Convention to attract new members into our club and into the hobby. Frank Lucas is our only relief, so far. You can help (and go the show). We also need a new/used market-type canopy -- have you got one you’re not using? Please call me, Nancy, at 925-408-9402 or email nunorris@aol.com to climb aboard. Our next event is July 5 and 6 at the NMRA Convention where we'll be running trains outdoors in front of the Convention Center. How's that for a California intro to model railroads? We'd love to have you bring a battery operated train or live steam train to run on the Roving Garden Railway. We need manpower/tabling, too, to schmooze with show goers. This side of the trailer looks like it's about to be operated on. You are looking at the trailer side which has been raised to make the side level while we work on it. Triangular plywood gussets support the road bed. We now have the geodesic scenery made and we'll begin applying the sections of the fake rock to the trailer side to make the cliffs. At the same time the roadbed half loop in front needs to be attached to the side so a mounting system needs to be fabricated. Same for the rear of each side. Our goal is to have trains running on this loop by February 26 at the annal meeting. We sure could use your help. This may be your last chance to work on this historic layout. Contact nunorris@aol.com with times that work for you to help. After two weeks of making geodesic scenery (fake rocks) for the trailer side gates, we can easily say, we need HELP! Our technique is in need of an expert's touch. What you see in the photo are sections of scenery placed on the trailer. Some of them were very difficult to take from the molds. You can also see that we have more space to cover. If you can give us a hand, we'll feed you and say nice things about you. 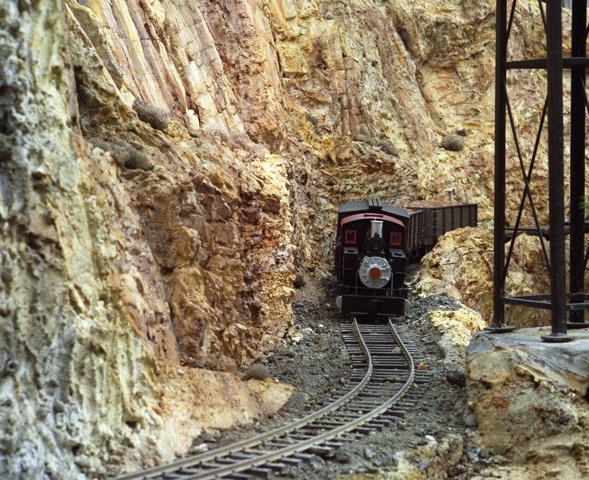 If you want to help with other things, like building roadbed of wood or covering track with fake gravel (polymer sand) we'd be happy about that too. Anyone? On the bright side the trees and groundcover are very happy, the water feature still flows and the trains still go. This beautiful 10-year-old tree was donated to BAGRS trailer by Don Herzog of Miniature Plant Kingdom. The December 8th rock making clinic has been postponed until Wednesday, December 15th due to rain. If you'd like to come to the clinic, please email nunorris@aol.com to get on the list in case the day is canceled again. Ray Turner will show us how to apply Bragdon molds and resin onto the trailer sides to look like this! For thorough instructions and a complete list of stuff we need. For this project we wanted a train with a simple, inexpensive control system capable of operating on no-powered track. The solution we adopted uses a 9.6-volt NiMH (nickel metal hydride) rechargeable battery available from Radio Shack and other sources. This battery fits into the engine cab and operates our small LGB locomotive for over four hours on a single charge. The battery uses a standard hobby connector making it easy to install a fresh battery when needed. While there are many radio-control throttles available on the market, we did not need speed or directions control for the display layout train. A small ON/OFF radio-controlled receiver with relay similar to those used for automotive alarms gives us the ability to start and stop the locomotive with a small remote control. Our remote control is catalog item number RC-10 from All Electronics Corp., www.allelectronics.com. This firm sells manufacturers production overruns and surplus inventory so we can’t guarantee that this particular item will be in stock in the future. However, similar remote controls are designed to operate on 12 volts DC, but the RC-10 receiver works on the 9.6-volt battery. Figure (photo 1) shows the circuit arrangement. The mating connector used to connect to the battery is also available from Radio Shack. Since these batteries can deliver a high current when short circuited, we included a resettable circuit protector, sometimes called a polyswitch, to protect the battery. This circuit protector is available from All-Electronics as item #CPX-100S. A two-amp fuse could be substituted for the circuit protector. The locomotive motor must be disconnected from the normal connections to the wheels and current pickup sliders. For our LGB locomotive, we removed the gearbox bottom cover plate and the removed the sliders and brass strips that carry current to the motor leads. This disconnected the motor from the rails. LGB locomotives include small sockets on the cab rear that connect to the motor brushes. We used these sockets to connect the output of the remote relay (battery positive) and battery negative to the motor. Now, pressing the remote’s ON button operates the relay and makes the locomotive go forward at full speed. Pressing the OFF button releases the relay and stops the locomotive. In our case, the locomotive speed is fine with the 9.6-volt battery. If the speed were too fast, we could have inserted one or more silicon diodes (All Electronics #1N4001) in series with the motor leads to reduce the voltage by 0.7 volts for each diode. Next Wednesday, December 8, 9AM, weather permitting, we will start applying Bragdon's resin rocks to the 10' trailer sides. Please go to the link below to do some reading homework so the whole, very complicated, procedure isn't a complete mystery. There is a lot of reading on the steps, videos to view and a list of materials. Edward is donating a quart kit of resin and other supplies that come with the kit and I am donating everything else but what's on the list below. Unfortunately, we have no funds left to buy some of the materials needed so we will have to work with what we have. I am asking you to look through your cupboards and donate anything from the list that you can spare. 2. Cast Satin™, white, odorless polymer casting resin. - Bragdon Enterprises. 5. White gloss spray lacquer - hardware or paint supply. 6. Plastic drop cloth or tarp - hardware or paint supply. 7. 3/16” thick poly bubble wrap in sheet or roll - packaging supply. 8. Fiberglass bug screen - hardware supply. 12. Stir sticks or plastic spoons - grocer. 13. 1 oz. plastic measured disposable cups. - restaurant or party supply. 18. Hot glue type glue sticks - Bragdon Ent., hardware or craft supply. 22. Black powdered tempera paint. - art supply. 23. Rubbing alcohol (optional) - grocer. This will be the first of several such clinics, so if you want to make it to another let me know and I'll try to schedule you into a date that's good for you, but come to work, not just watch. Lunch around noon. As you can see, we have many of the parts roughed in for the lower loop. On the far left is a steel suspension bridge built by Jim Daly. It needs to be mounted by bolts to the wooden trailer side. Bill already fabricated a mounting system. Front right is a benchwork style curved bridge made from ripped lengthwise bend R board, donated by Edward. Now we need help mounting it all and making the connections accurate for track. Next meeting is Wednesday, Dec. 1.